Anjaneya Swamy Temple Singanamala is located in Singanamala, Anantapur district. 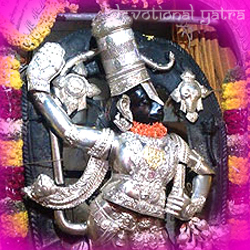 That is to say, the idol of this temple is Anjaneya Swamy. To clarify this is the oldest temple as it was built during 16 th century. To demonstrate the history, once the grandson of Arjuna named Janamejeya did yagna for Vayudeva blessings. During Sri Krishna Devaraya period, a sage named Sri Vyasaraja built this temple. Because in his dream he saw Vayudeva and instructed to build the temple at this place. Moreover, he also started to build Hanuma idols across India. Here, the temple opens at 7:00 Am and closed by 7:00 PM every day. By Air: The nearest Airport to the temple is Bangalore International Airport, with a distance of 203 km. On Rail: The nearest railway station is Anantapur Railway Station. So, it covers a distance of 24 km. By Road: The Pamidi Bus Station is nearest to the temple. However, APSRTC runs Number of busses from major cities to here.